In Welsh Tenby is Dinbych-y-Pysgod, meaning little town of the fishes or little fortress of the fish. 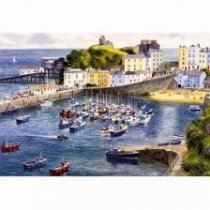 Tenby is a delightful little harbour town and seaside resort. Surrounded by an imposing medieval stone wall it is steeped in ancient history. From the early 19th century, Tenby became a fashionable holiday destination for both the Welsh and the English. Today it is as popular as ever partly due to the fantastic beaches stretching to the north, the west, and the south of the town.